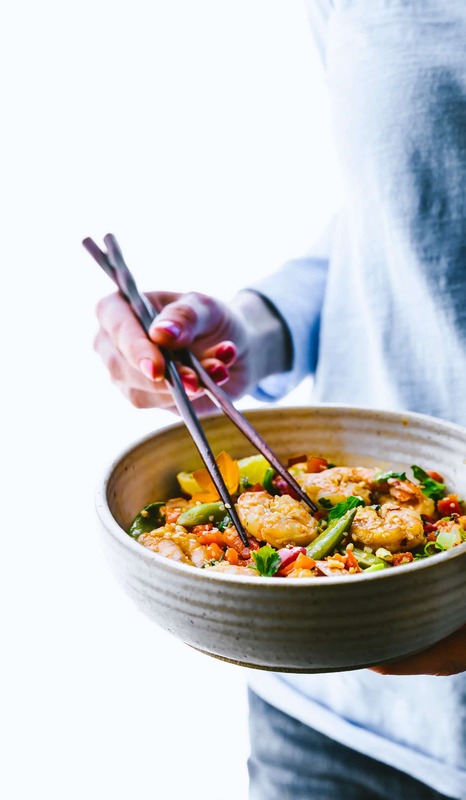 You’re gonna love this Wok-fired Orange Garlic Shrimp stir fry recipe! It’s full of fresh, snappy Asian flavors and made all in one pan! 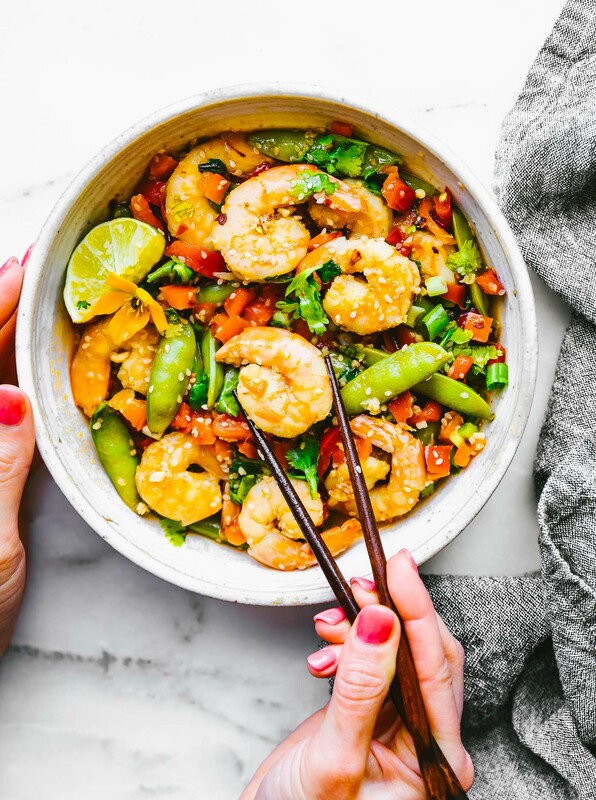 Shrimp, bell peppers, and snap peas are coated in a delicious spicy honey orange sauce. Gluten free and can be adapted for a paleo version. And next up for cookbook loving week! 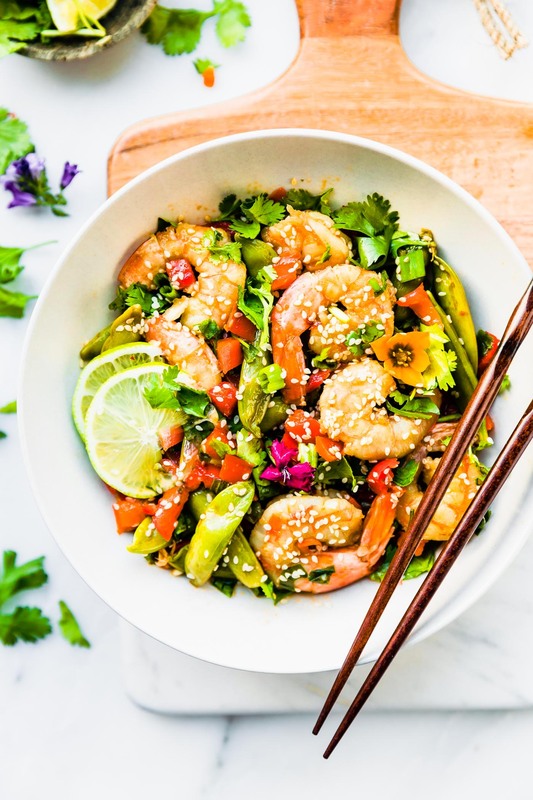 This paleo friendly Wok Fired Orange Garlic Shrimp brought to you by my lovely friend, Jessica Gavin! If you haven’t met Jessica Gavin, you’re in for a real treat – no pun intended (ha! ), but take a look at her stunning desserts! Jessica is my soul sister of cookbooks, since, ya, we were in the thick of creating our cookbooks at the same time and I can’t tell you enough how awesome she is! 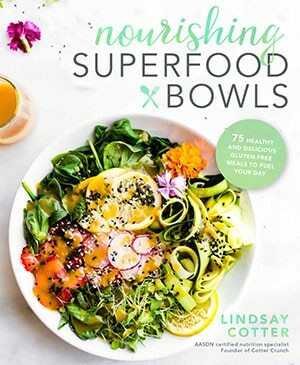 She even helped me promote my cookbook with this Orange Chicken and Broccoli Rice Bowl. I’m sensing an orange theme here, you? 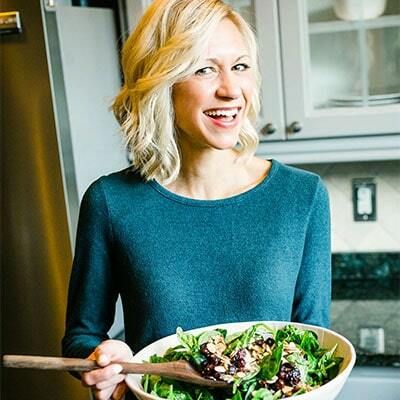 Jessica is a culinary science genius, and coming from a nutrition nerd, I’m sooooo impressed by her knowledge of food. Like, REALLY impressed! Can I admit something embarrassing? I didn’t know how to heat a wok properly before reading this cookbook? Ya, the things you learn from the pros! Bless them. Consider me a WOK specialist now. That certification exists, right? Now, let’s talk about the orange garlic shrimp recipe. And my hot red nails. Kidding. Just seeing if you were paying attention. Did I mention it’s gluten free and loaded with antioxidant rich bell peppers and snap peas? 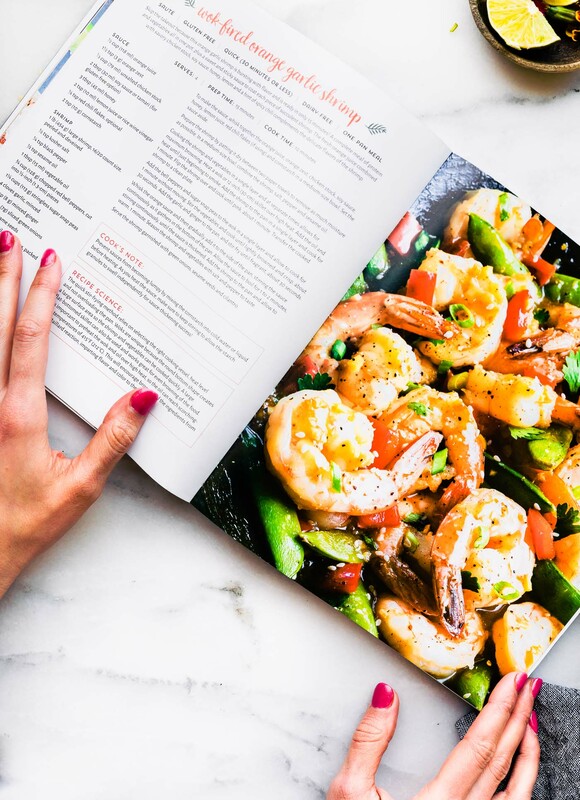 And ya, her cookbook really helps you understand how to cook certain foods properly, like shrimp. We all know there’s a VERY fine line between perfectly cooked shrimp and rubbery overcooked shrimp, am I right? I learned my lesson once before. But practice makes perfect, or in my case, recipe testing testing testing! Which is how I came about making that crock pot shrimp taco recipe. Testing! It’s absolutely a favorite now, no rubbery shrimp results, that I promise you. Anyways, Jessica is so talented at explaining how to do it right! And for me, the best part was learning how to make the sauce extra saucy, does this not sound like knowledge you would like to have? The spices were balanced perfectly, and the fresh flavors popped. It’s one of those dishes that I’ll make all summer, and it works for lunch or dinner. 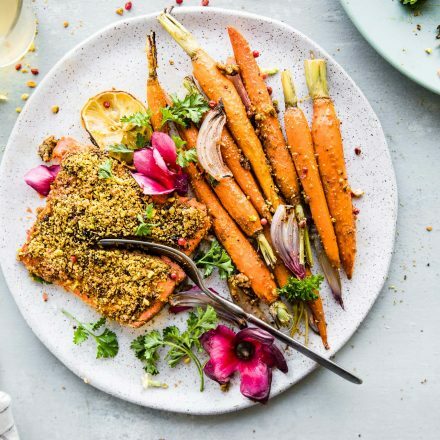 If you want more bulk, serve it with cauliflower rice or quinoa, but it’s also pretty perfect as is. I think that’s enough to tempt you to make it. Yup. My work is done. Let’s eat. 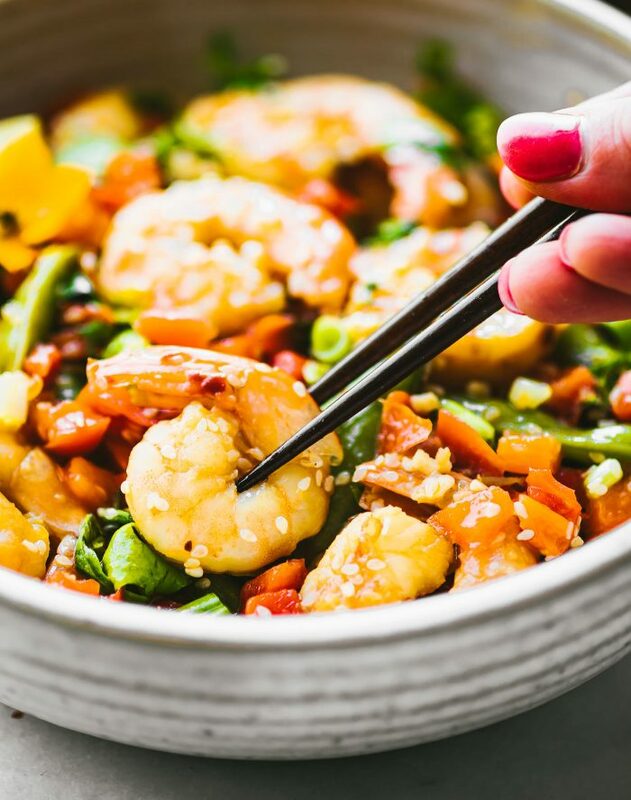 Wok-fired Orange Garlic Shrimp stir fry recipe! 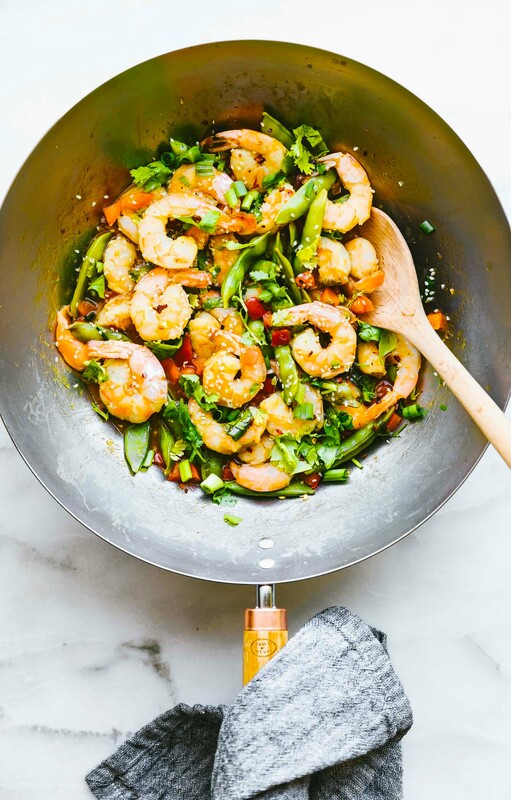 It’s full of fresh, snappy Asian flavors and made all in one pan! 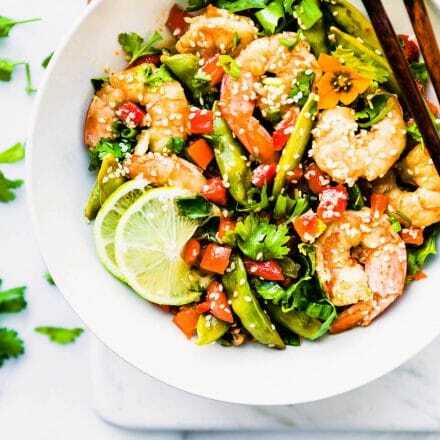 Shrimp, bell peppers, and snap peas are coated in a delicious spicy honey orange sauce. Gluten free and can be adapted for a paleo version. 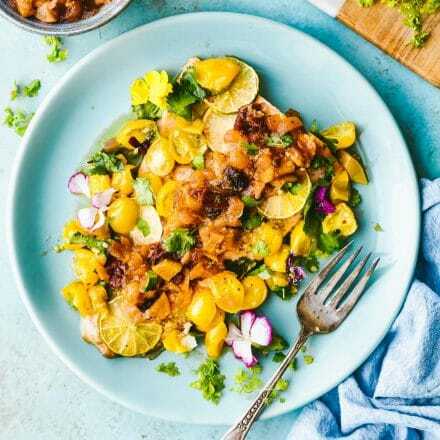 To make the sauce, whisk together the orange juice, orange zest, chicken stock, tamari sauce, honey, lemon juice, red chili flakes (if using) and starch in a medium-size bowl. Set the sauce aside. Prepare the shrimp by patting it dry between two paper towels to remove as much moisture as possible. 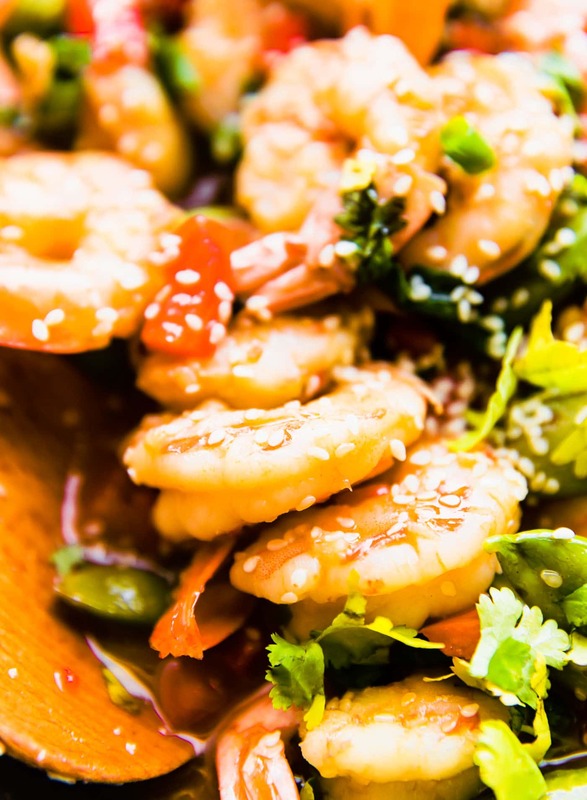 In a medium-size bowl, combine the shrimp, salt, pepper and sesame oil. Cooking the shrimp and vegetables in a single layer and at separate times allows for maximum browning. Heat a wok or 12-inch skillet over high heat. Add the oil and heat until just beginning to smoke. Add the shrimp to the pan in a single layer and cook for 1 minute. Flip the shrimp over and cook until pink, about 1 minute. Transfer the cooked shrimp to a clean plate. Add the bell peppers and sugar snap peas to the wok in a single layer and allow to cook for 1 minute without moving. Stir the vegetables and cook until lightly browned and crisp, about 30 seconds. Add the garlic and ginger to the pan, and stir-fry until fragrant, about 30 seconds. Whisk the orange sauce and then gradually add it to the side of the pan, stirring the sauce continuously as it gathers in the bottom of the pan. Allow the sauce to boil for 1 to 2 minutes, stirring continuously, until the sauce is thickened. Add the shrimp to the pan and allow to warm, 1 minute. Season the shrimp and vegetables with salt and pepper to taste. Adapted with permission from Easy Culinary Science for Better Cooking. Have you learned proper wok-fired cooking techniques? Maybe you’re in my same boat and still learning, always. Which is why I love cooking. There’s always a new (or traditional) way of cooking your favorite meals. Let’s start with orange garlic shrimp and go from there. Sound good? I’m down with the wok n’ roll one pan meal. It’s Friday, extra corny here. p.s Speaking of new and traditional Asian recipes, we just posted a NEW EASY KIMCHI RECIPE video. I promise, you will love making this. And I promise it is SO SO EASY! Give it a whirl, for gut health support. The pops of color in this dish are so vibrant! Just beautiful! 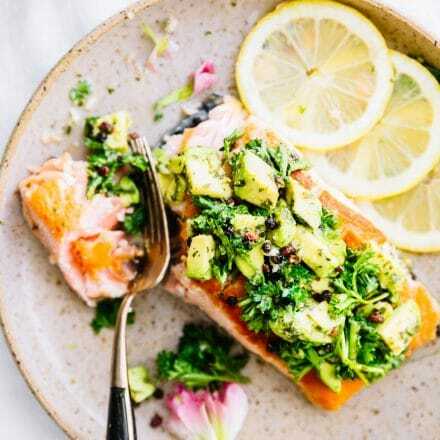 Love everything about this – so much flavor and so fresh! I love the use of such fresh flavors! Oh my soul sista, you always make everything look so stunning, irresistible and colorful! I’m so happy that we could venture through our cookbook journeys together, I would not have survived without you! Thank you so much for taking the time to make this recipe and support the launch. You inspire me by your creations, so lucky to be your peer but mostly your friend. Love you to pieces! Ps let me know if you try it! That sauce though… on point! 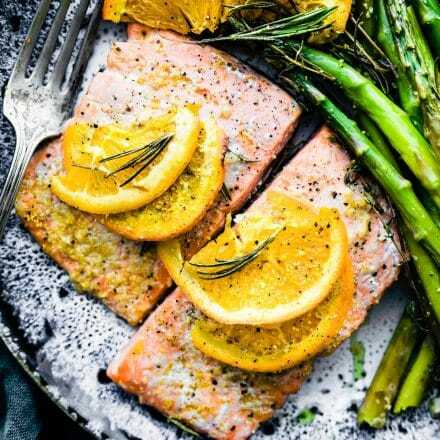 You have shared such a nice recipe by which anyone can prepare such a nice dishes. As I have gone through your post your recipe post seems to hygienic and good for health. wow, that’s great. i really like this dish, thank you for sharing the way, i will try the way you share it.